Well, that’s that. The Walking Dead is done for 2011 and will remain off the air for 2 months (returning February 2012). And here at bitchstolemyremote, we’ve got to tell you: it’s going to be a long wait. I’ve been staring at the blinking cursor for seemingly hours, just in awe of the last scene of the fall finale of The Walking Dead – ‘Pretty Much Dead Already”. I never thought I would get emotional about, of all things, zombies. But I gotta stand up and applaud the creative team behind The Walking Dead for a stellar first half of the show’s second season. I had to put the kibosh on a traditional recap because I knew the fall finale would give us a key moment/scene to talk about– and in my opinion, “Pretty Much Dead Already” did not disappoint. First on the agenda has to be the final barn showdown. GAH! I can’t even seem to find the words but that was frickin’ amazing. Quick summary: After hearing another passionate plea for letting the newbies stay at the farm, Hershel (Scott Wilson) asks Rick (Andrew Lincoln) to help him round up a couple of swamp zombies to join the barn collection. You see, they were Hershel’s neighbours, and if Rick and the group want to stay, they’ve got to shift their view of ‘walkers’ to ‘sick people’ and apparently, this is how to do it. On the way back to the barn with a couple of new ‘friends’, Shane (Jon Bernthal) sees Rick playing nice with the walkers and completely flips out. There’s a whole lotta yelling and dramatic buildup and Shane becomes increasingly unhinged as the scene progresses. 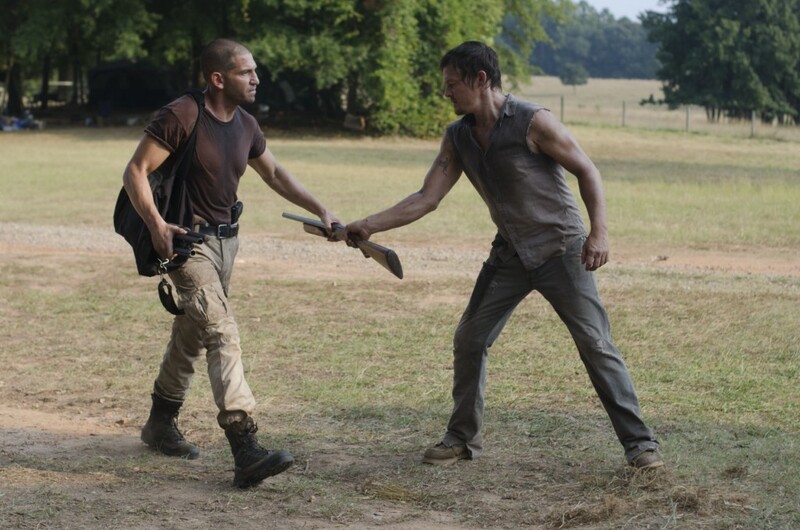 Shane’s going to prove his role as alpha leader one way or another – first by taking out one of the two new zombies as a very powerless Hershel holds onto the leash. 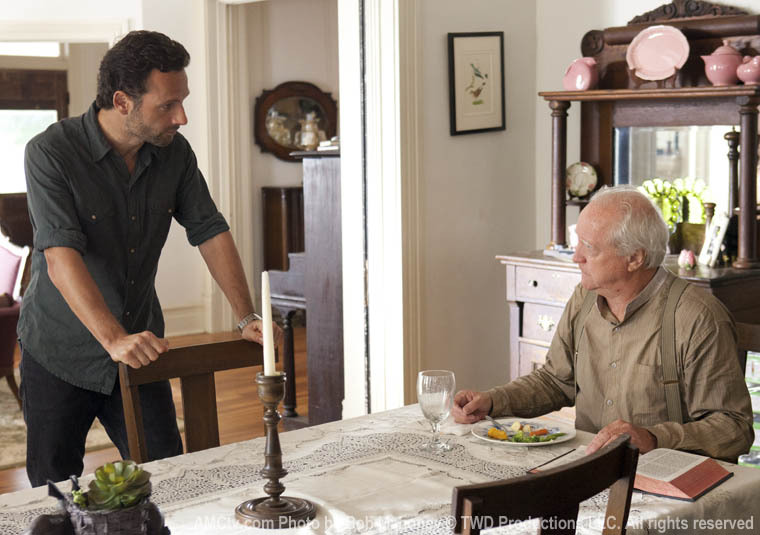 Hershel is rendered speechless and falls to his knees while Rick desperately tries rationalize with Shane. But there’s no stopping him and Shane eventually breaks the chain locks on the barn. Rick can’t physically stop him because he’s still holding on to his stick zombie so the barn walkers slowly come out one by one to meet their execution. The others in the group, all of whom have gathered around with their own guns, don’t have much choice but to join the zombie massacre and take out the barn walkers a la firing range. 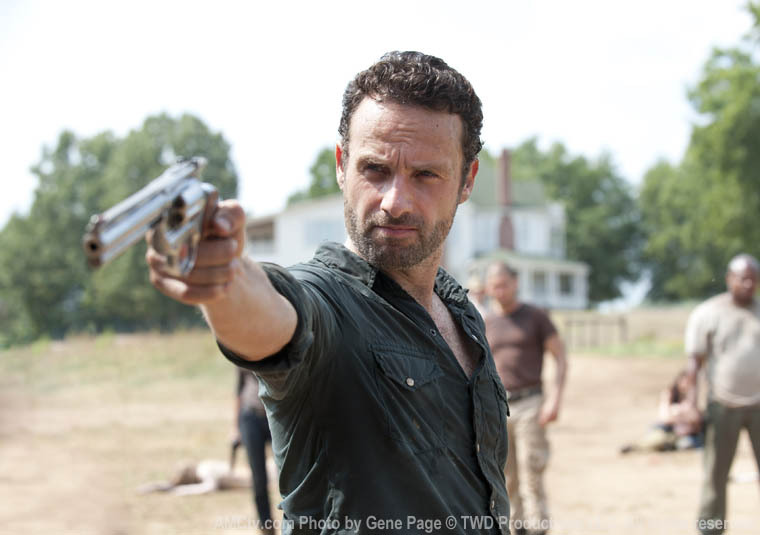 Rick, significantly, doesn’t join in the shootings as Hershel and his crew continue to cower. Hershel’s world is unraveling rapidly before his eyes, and he just can’t seem to deal with it. I never thought I would sympathize with zombies, but in this truly cinematic, penultimate scene, I couldn’t help it. Intercut with Hershel’s agony, the swelling music…I felt sorry for those zombies! Hershel’s been nursing them for who knows how long? And now he’s losing them all over again, this time for good. For those viewers who didn’t empathize as quickly as I did, the episode had one final trick up its sleeve. The big reveal of the episode (and likely the entire season) smacks us all in the gut when the last little walker to come out of the barn is none other than Sophia (Madison Lintz), the girl they’ve been searching for all this time. The emotion is palpable as the gang, including cray cray Shane, can do nothing but watch as the realization that everything they’ve gone through this season has resulted in this tragic moment. Everyone seems to be paralyzed with emotions ranging from sadness to shock to grief, and I was right there with them. Rick finally cements his role as true leader when he does what no one else can seem to do – shoot little zombie Sophia in the head. It was a perfectly played scene from the cinematography, to the editing, the soundtrack and of course, the performances. Admittedly, the buildup to this final scene was a bit “slow”, but I think the entire six episode lead up to this moment was completely worth it. If we weren’t so frustrated about where the heck Sophia was, her demise wouldn’t have been so tragic and heart wrenching. Well played everyone – my hat is off to you. It’s moments like these that television simply cannot be denied as a legitimate art form. But there’s so much more to talk about in this episode! I pass it to cinephilactic to chime in with his thoughts on this final scene and pick up on the other interesting moments of the fall finale. Well, I’ll admit that I didn’t have quite the same emotional reaction, but admittedly this was because I spent the episode expecting (dreading?) this development. It occurred to me when Herschel mentioned to Rick in the swamp that Otis (Pruitt Taylor Vince) had previously gathered the zombies for the barn that Sophia might be among them. This would explain why Rick’s group had had no luck finding her, but also why no one at the farm had mentioned she was there: the only person who might have been able to identify her was killed before he even knew she was missing (remember that Otis was killed the same night that Rick arrived at the farm with Carl). This simple realization was even more powerful for me because it reinforced just how much damage Shane has caused the group. Beyond the implications of the barn massacre that we’ll have to wait months to see, Shane is responsible (by extension) for the heartache that the group has incurred: the continued suffering of Carol (Melissa Suzanne McBride), the injuries that Daryl (Norman Reedus) accrued in his fall and the near-death of Glenn (Steven Yuen) in his numerous close-calls. For me this episode wasn’t so much about the reveal of Sophia’s undead status, though I freely admit that it was incredibly powerful and really well shot & edited. 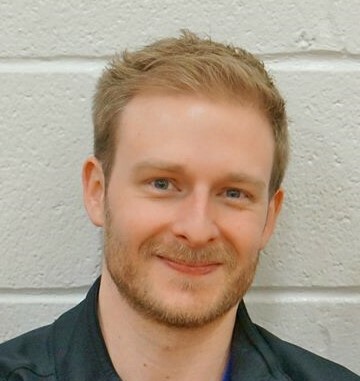 These past few episodes have been all about the fall of Shane, and setting him up to become the group’s principal antagonist. He’s created an insurmountable rift between the group and Herschel that I can’t imagine they’ll be able to repair. Beyond this I think he’s poisoned his relationship with Lori (Sarah Wayne Callies), especially in the way he dealt with Carl (and offering him a gun? Bad move!) and now that Rick has stepped up to truly lead the group by killing Sophia, Shane’s role in the group is a question mark. The final straw may be the way that he’s threatened Dale (Jeffrey DeMunn), who admitted he knows the truth about Otis when they had their confrontation over the guns in the swamp. That was another highly memorable scene for me. At this point I think it’s only a matter of time before the group either casts Shane out, or he does something that prompts someone to kill him for the betterment of the group. TVangie, what do you think the future holds for Shane? Will his burgeoning relationship with Andrea (Laurie Holden), who praised him because he’s “not a victim” help to save him? And ultimately, does this final scene alone save what many viewers have considered a season in which “nothing has happened”? Shane’s a difficult character for me. In the first season, and arguably up until the Otis sacrifice, I could not stand the guy. (I freely admit, part of that was due to a bit of Eastwick carryover) But the Otis thing really shook me, and I feel like Shane has very quickly become one of the more interesting characters. He’s really showing us that this is indeed a new world, and that in order to survive we’ve got to change our thinking. We need Shane to be unstable to serve as counterpoint to the Rick, Dale and even the Hershel books of moral code. Which brings me to another point – I disagree with the chatter that this season has been about ‘nothing”. I think the whole season has brought up some really poignant issues of what an apocalypse would be like and how truly complicated things are. The slow pace beckons the audience to really give pause about moral issues that we so easily compartmentalize into proverbial “right” or “wrong”. Daryl’s arc is probably the most telling of this. In ‘Chupacabra‘ (2×05) we saw him wrestling with his inner demons trying to reconcile what’s been engrained in him versus what he’s experienced. Does he still believe in what Merle (Michael Rooker) taught him after everything that’s happened? He’s another character that I initially cared nothing about, but I think has become one of my favorites this season. Yes there’s been a lack of zombie-chasing action I suppose, but the morality issues are far more interesting and resonant. As we saw with the Otis takedown and the final barn scene, the zombie killing is far more effective when there’s some emotional weight behind it. Simply running from zombies, no matter how impressive the special FX are, will get boring very fast. I think the show runners were smart in anticipating how to keep their audience, while roping in some new viewers. As for Shane and Andrea, I’m really not convinced it’s a ‘burgeoning’ relationship at all. Clearly shooting zombies gets her hot. She had an itch that needed scratching and that’s that. Neither of them seems interested in each other in any other way aside from releasing some tension. I will say that if the group divides (which it very likely will) Andrea is going to side with Shane and opt for brute survival vs. adaptability. What did you think of Glenn’s speech to Maggie (Lauren Cohan), cinephilactic? Again, I thought it was a breath of fresh air – an instance where some plain common sense was expressed. I was already getting pretty tired of her little hissy fit and was glad that it shut her up. And what do you think will happen to Carl (Chandler Riggs)? Aside from the poor little guy having to do homework (!!) during a zombie apocalypse (because you never know when you’re going to need to whip out some algebra) do you think seeing zombie Sophia will harden him going forward? Is he a little Shane in-training? I’ve been a big Maggie fan for the better part of this season (hell, I even liked Lauren Cohan when she had a faux British accent on The Vampire Diaries). While I think that the writers are still struggling to create interesting female characters *cough Lori&Carol cough*, Maggie has had personality to spare, even when you do occasionally wish she would shut up. While I was frustrated by Herschel’s perspective on the zombiepocalypse, it was different with Maggie because she had interacted with the outside world and was struggling to balance her allegiance to her family and Glenn which I found easier to relate to. Glenn’s speech, in a way, was a demonstration of what I think the writers were attempting, which is to say that this extended stopover at the farm has reinforced how easy it is to become complacent and forget about the dangers of living in this new world. I’m not certain that the length of time we spent has been entirely worth it, but I can see what the goal was. For an alternative point of this, check out Mo Ryan’s rant about what’s gone wrong this season here. It’s interesting, TVangie, that you think that the group will separate. Do you mean split off from the farm, or fracture between members? To a certain extent, I think that separating the group might help to allay some of the narrative challenges that the show has encountered thus far (consider some of our isolated character stories from the first season such as Rick’s forays into Atlanta with Glenn). I do think, without being overly sentimental, the show could do with whittling down some of its large cast, especially some of these characters that we really don’t know anything about. I’d rather have more screen time for engaging characters like Daryl than allow T-Dawg/Pain/Bone to wander around aimlessly. I do think the group, our group, is going to fracture internally. I actually don’t want this to happen as the possibilities for fireworks are more likely if the group stays together. But just as we had Jack’s group vs. Locke’s group in Lost, whenever you have two polarizing leaders, something’s gotta give and you’re likely to get two groups eventually. Plus the divide is pretty obvious (Rick, Lori, Dale, Glenn on one side and Shane, Andrea, Daryl and Maggie (After what’s happened to Sophia I think she’s apt to develop a serious hate-on for Rick) on the other) I do think think T-Dog (poor IronE Singleton, I noticed you were billed only as a guest star this week!) is dead weight. I thought his infected cut would have put him away for good – instead, he’s healed and starring as moving scenary. He doesn’t even get to wear the fun prosthetics! Maybe they’ll develop him if we fracture into groups – but you can bet he’s going to follow Daryl to further push his moral compass. I do think that if we see any core-group deaths in the upcoming future (I know it’s coming!) it’ll only happen to the characters that we’ve developed some attachement to. If the group doesn’t fracture physically, then one of the leaders has to go. I predict that Shane will probably be the one to eat it next – and he’s definitely not going to be killed by a walker. Perhaps some one from Hershel’s camp will be outraged, or maybe even Carl will do the deed in defense of his father? Who knows? The point is I’m really excited about the possibilities and therefore, think The Walking Dead hit a homerun with this first half of the season. What do you think viewers? Think my predictions are way out of left field? Sound off below – remember – no spoilers from the source material or into the zombie barn with you! Having seen Lauren Cohan in an interview, I’m pretty sure the English accent is real. Her imdb profile says she was born in the US but spent a good deal of her childhood in England. Just to clarify in the last paragraph you say maggie will have a hate-on for rick after what happened to Sophia, you meant Carol right? Secondly I think the writers will definitely keep T-dog around if only so Michael Rooker (Meryle) can tear into him upon his return. Rather I would like to see Carol end up dead because in my opinion she adds little to the story and the repurcussions of her death would have a large impact (Daryle and Lori’s reactions spring to mind). Also I agree that Shane’s days are very numbered but I think your idea of two groups would be decidedly more interesting. Whoops yes, you’re right – thanks Jordan for the catch – It is indeed Carol who I think will who will likely continue in her spiral of scapegoating Rick for what’s happened to Sophia. I agree that they’ll also have to keep T-Dog around, I just hope they give him more to do. Perhaps he’ll get his own arch like Daryl, Shane and arguably even Andrea have had during this first part of the second season. I guess they couldn’t cram everyone in. Here’s hoping. I also think Shane has definitely gone off his cracker and some one will likely try to put him down like a rabid animal. I just don’t think it will be as obvious as Rick, Lori, Dale or even Herschel doing it. We’ll see – I’m definitely intrigued and can’t wait till February.